We’ve all heard something along these lines in all walks of life, but I’m finding that these sentiments tend to be much more prevalent in the world of education. I always thought that I was not very tech-savvy, but I was amazed at the level of incompetency in a variety of technological skills and the absence of motivation to learn new tools displayed by some of my colleagues at the start of the year, and was dismayed to find that the problem seemed to exist in most schools as well. Why is it that teachers and teacher-candidates seem so unwilling to learn new technologies? I discussed my observations and concerns with some more tech-savvy friends and colleagues, and tried to pinpoint the nature of this unwillingness. Why is it that we are so against signing up for a new website, or switching to a different email provider? I recently picked up Isaac Asimov’s Roving Mind, as per the recommendation of Maria Popova (7 Must-Read Books on Education), and was delighted to find that Asimov had articulated the problem more perfectly than I ever could have imagined, in his brilliant essay Technophobia. Asimov thus defines technophobia as “the fear of re-education” and explains that “we invent reasons for resisting the change, but the real reason is that we dread the process of re-learning.” We see this fear rear its ugly head in all shapes and forms: business executives refusing to implement new software, the American public fearing a transition to the much more logical metric system, and writers (Asimov included) who fought the adjustment from typewriters to computerized word processors. Asimov uses the example of his resistance to the word processor (this was written in 1982) in order to illustrate some valuable insights. He resisted the transition to a computer from a typewriter not because he loved his typewriter, but because he had put so many hours into learning how to use that typewriter. He did not want to have to learn something new, especially when (as far as he was concerned at the time) the new tool offered little improvement in quality over the old tool. In 2011, I’d argue that point – as we now see just how fluid and dynamic digital text can be, and the freedom we have as a result. 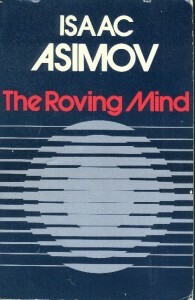 Asimov makes another good point in saying that “re-education must be recognized for the highly difficult (and even more so) embarrassing process it is.” He goes on to explain that he only agreed to switch to a computer when his publisher sent Radio Shack employees to his home, so that he could learn the new tool in private, away from the eyes of more experienced users of word processors. I think that this is an important insight for educators who want to bring new tools into the classroom. Perhaps we can utilize virtual classrooms and blended learning in order to give students (and teachers) access to new websites and software from the privacy of their own homes, away from the judgmental eyes of their peers.